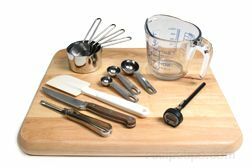 When preparing slow cooker recipes, safety should be a concern not only in cooking the food properly for the slow cooker recipe but also in using a slow cooker. Although slow cookers are safe appliances to us, there are still safety guidelines that should be followed. Slow cookers are very safe appliances to use, but when cooking food, whether you are using traditional recipes or slow cooker recipes, there are some safety guidelines that should be followed to ensure that the food being cooked reaches the appropriate temperature so it is safe to eat. The temperature the food must reach to be safe for eating will depend on the type of food being cooked. It is also important that the food cooked using a slow cooker is stored properly before and after cooking to ensure safety. Slow cooking is a safe cooking method that can be used to cook food while you are at home and busy with other tasks or while you are away from home working or running errands. As long as proper safety guidelines are followed when using the slow cooker it can be left unattended while the food is cooking because of the low temperatures it uses. The safety guidelines below should be followed whether the slow cooker will be attended or left unattended during the cooking time. 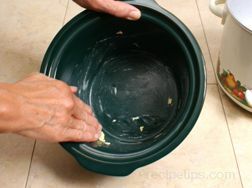 Do not use the slow cooker if the crock has a crack or severe scratches. 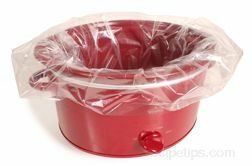 This can weaken the strength of the crock and it may break during use, causing a very unsafe condition. Be sure the slow cooker is placed on a flat, sturdy surface during use. Keep the cord to the slow cooker as short as possible. Most cord on the slow cookers are fairly short for safety purposes but if there is excess cord it is a good practice to band it up and leave it just long enough to reach the outlet easily. Excess dangling cords are dangerous in that they can easily get caught on things or can be reached and pulled on by small children. If using an extension cord, make sure it has at least the same electrical rating as the slow cooker. 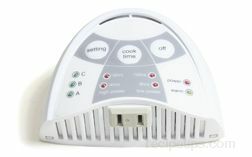 If the extension cord is warm to the touch when it is being used, it is not sufficient. Be sure that the cord is not in the path of a walkway and that it is not draping somewhere that it might get caught on something. Also, be sure it is out of the reach of small children. During the cooking process the cover will be hot, so always use pot holders or oven mitts when handling the slow cooker cover. The outer heating unit of the slow cooker on most models will also become very hot and should be handled with care. Keep it away from any objects that cannot tolerate the heat and keep it out of the reach of children. Be careful not to expose the crock to extreme temperature changes. 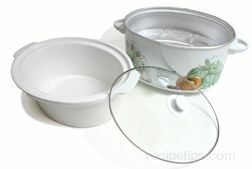 If the crock is cold and hot ingredients are added or it is placed in a heating unit that is hot, the crock can crack. 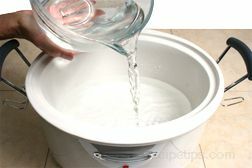 Also, if the crock is hot and it is exposed to cold food or water it can crack. When you are done cooking with the slow cooker, be sure to unplug the unit immediately. Never immerse the heating unit in water. Because some of the newer models cook a little hotter and because all models are a little different, it is a good idea to check the cooking temperature of the slow cooker before preparing your slow cooking recipes. You want to make sure it is cooking at a high enough temperature to cook the food properly and low enough so that it is safe to leave the slow cooker unattended. Use the following temperature check to be sure the slow cooker is cooking at safe temperatures. Add 2 quarts of lukewarm water to the crock. 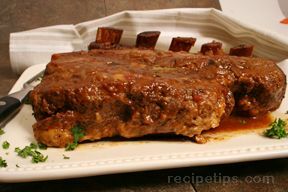 Cover and turn the slow cooker on low and allow it to heat for 8 hours. Do not remove the cover during the heating time. 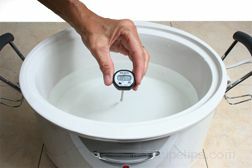 After 8 hours of heating, remove the cover and quickly take the temperature of the water with an instant read thermometer. The water should be at least 185°F. If it is much higher, it is an indication that after 8 hours of cooking, some foods may be overdone. 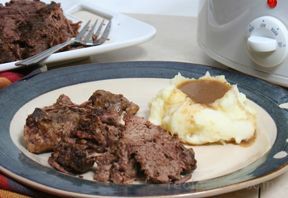 If the slow cooker is cooking over the 185°F, the cooking time should be reduced. If the temperature is under 185°F, the slow cooker may not cook hot enough to eliminate problems with food safety. 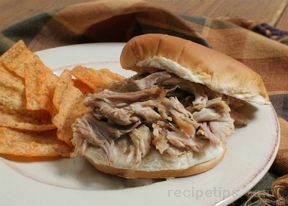 If the slow cooker is not reaching the 185°F after 2 hours then it would be best to replace it. Start with a clean environment. 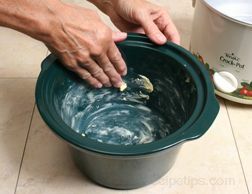 Be sure the slow cooker, utensils, and work area are clean. Wash hands before beginning any preparation. 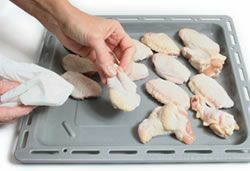 Wash utensils, work area, and hands with hot soapy water after working with raw meat or poultry. To decrease the chance of cross contamination, use two cutting boards when preparing food. Use one cutting board for cutting meat, poultry, and fish. 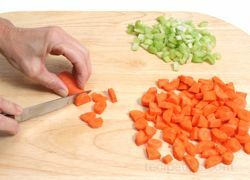 The second cutting board should be used for preparing other foods, such as fresh fruits and vegetables. Be sure to cook the food for the appropriate length of time and that it reaches at least 165°F, which is the temperature at which bacteria in food is destroyed. Avoid placing the slow cooker near an open window where a cool draft might prevent it from reaching the appropriate temperature quick enough. The same type of problem may occur if the kitchen is at a lower than normal temperature. Do not use frozen ingredients in the slow cooker because they will cause the contents of the slow cooker to take too much time to reach the appropriate temperature and will cause the suggested cooking time to be insufficient. 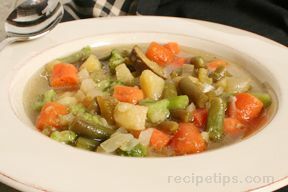 If you would like to use frozen vegetables, be sure they are completely thawed before adding them to the slow cooker. Be sure to check meat and poultry for proper doneness. Use an instant read thermometer to check the internal temperature of the meat. The minimum temperature for the different meats is shown in the chart below. If the meat and poultry reaches these minimum internal temperatures, any harmful bacteria should be eliminated. 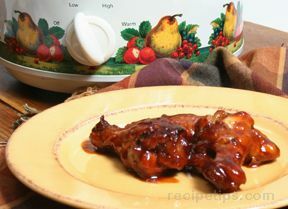 To see more information on meat and poultry doneness, click on each of the individual links below to RecipeTips.com. 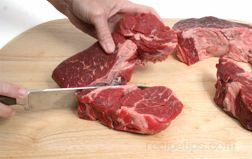 To check meat without an instant read thermometer, see the doneness links above. Do not put ingredients straight from the refrigerator into the cork. Remove them from the refrigerator long enough for the chill to be taken out of them. If the ingredients are too cold it can take to long for them to reach a safe temperature. If you have prepared the dish beforehand and stored it in the crock in the refrigerator, be sure to remove it from the refrigerator 45 minutes to an hour before starting the slow cooking process. 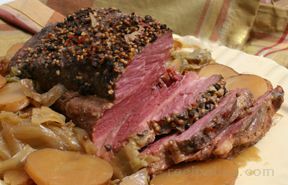 If preparing a slow cooker meal ahead of time to refrigerate and cook later that contains raw meat, do not mix the raw meat with the other ingredients. 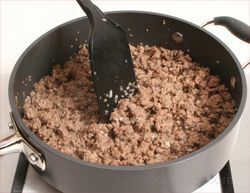 Store them separately and then combine them just before beginning the cooking process. Do not partially cook meat and poultry and then store in the refrigerator to finish cooking later. Never reheat food in a slow cooker. Food does not reach 140°F, the temperature where bacteria growth is prevented, fast enough when reheated in a slow cooker. The food can be reheated to the proper temperature on the stove, in the oven, or in the microwave and then kept warm in a slow cooker. If the power goes off during the slow cooking process, finish cooking in another manner, such as on a gas stove, grill, or take it somewhere that has power. 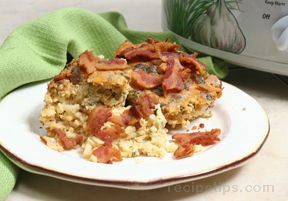 If it was completely cooked when the power went out, it should be safe to eat for up to two hours if left in the cooker. If you were not home when the power goes off, you will have no way of knowing if the food was done before the power went off. It is best to throw the food out even if it looks like it might be done. As with any type of cooking, it is important that the food cooked using the slow cooking process be stored properly before and after cooking. See storage guidelines below. Store meats, poultry, and fish properly in the refrigerator or freezer until needed. If frozen, thaw properly. Fresh fruits and vegetables that require refrigeration should be kept in the refrigerator until ready to prepare. If foods are prepared a head of time for slow cooking, refrigerate the ingredients until cooking. Do not combine meat, poultry, or fish with other ingredients. Store separately and combine just before cooking. When food is finished cooking in the slow cooker, it can be stored safely in the slow cooker with the cooker off for up to two hours. After that the food should be removed and refrigerated. 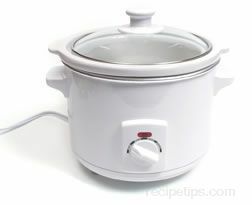 If the cooker is left on the "warm" setting, it can be left in the slow cooker for a longer period of time. 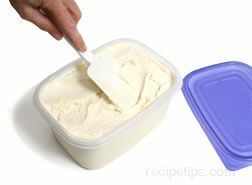 Store leftovers in shallow airtight storage containers to allow them to cool down more quickly when refrigerated. Refrigerate leftovers as soon as possible. Do not allow them to sit at room temperature for more than one hour. Eat within 3 or 4 days. 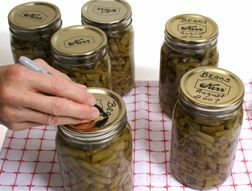 If they will not be eaten within this time, store in the freezer in airtight containers that are freezer safe.